Pep Guardiola said 17-year-old Eric Garcia was "incredible" in his competitive debut for Manchester City as they edged past Leicester City on penalties in the Carabao Cup on Tuesday. "He was incredible. He has a lot, a lot, of personality. In the pre-season, in the United States, he was incredible. He commanded all the [defensive] line. He played against Liverpool and Bayern Munich, he was incredible. He had a tough injury and for two months he could not play with us. "He is a guy who has a lot of sense of the position. He is so smart; he is not the strongest in the air with the headers, he is not the fastest one, but few times do the opposition win one position where he is. He is able to guide the line and has a lot of personality to play—good vision, good passing." Guardiola added that Garcia "did not make one mistake" on a night when Kevin De Bruyne's opener was cancelled out by Marc Albrighton's 73rd-minute goal at the King Power Stadium. The encounter went to penalties—there is no extra time in the Carabao Cup and missed efforts from Christian Fuchs, James Maddison and Caglar Soyuncu saw City through to the last four. 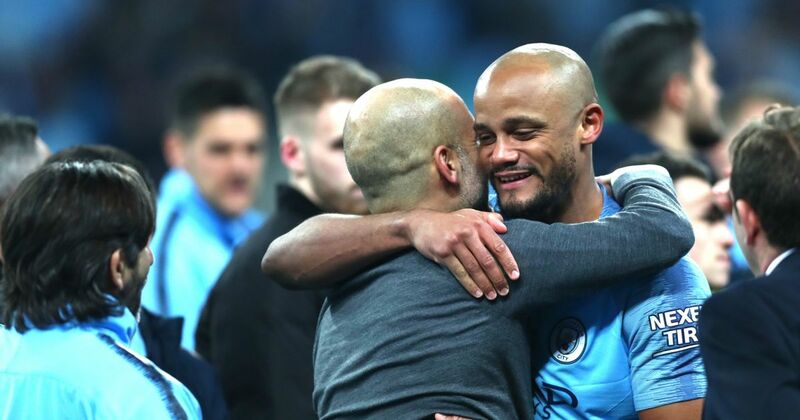 The defending champions are looking to win the competition for the fourth time in six years, and Guardiola picked a side mixed with experience and youth to face Leicester. De Bruyne and Sergio Aguero were notable inclusions as they have recently been sidelined through injury, and the former marked his return to the starting XI with a fantastic goal from outside the area in the 14th minute. Riyad Mahrez, Kyle Walker and John Stones were other senior players called upon against Leicester, and Garcia was joined by fellow youngsters Brahim Diaz, Phil Foden and goalkeeper Arijanet Muric. Garcia is a product of Barcelona's La Masia academy and has represented Spain at under-17 level. He joined City in the summer of 2017 but introduced himself to a much wider audience with his assured performance against Claude Puel's Foxes. As with Foden, Guardiola is unlikely to accelerate Garcia into the regular first-team setup. But Tuesday's performance showed that City have a number of accomplished young players on their books who could play key roles in the senior side in a few years' time.